Logan County is in central Illinois and was established in 1839. Warren County, Iowa was formed in 1846. The county seat is Indianola. Louisa Taylor Long was born in Perry Township, Shelby County, Ohio on November 27, 1848. She was the daughter of Jacob Taylor and Sarah Branstiter. She married Thomas Long on March 28,1869 when she was twenty in Lincoln, Logan County, Illinois. Their children and life together are described in detail in the section on Thomas and Louisa Long. She was active in charitable and church organizations such as the Ladies Aid Society and the Royal Neighbors. "Hello We thought we would come over for Dinner. Get busy for we are hungry. Had these taken just before we started to the country Sunday hain't they the limit, rec u letter." 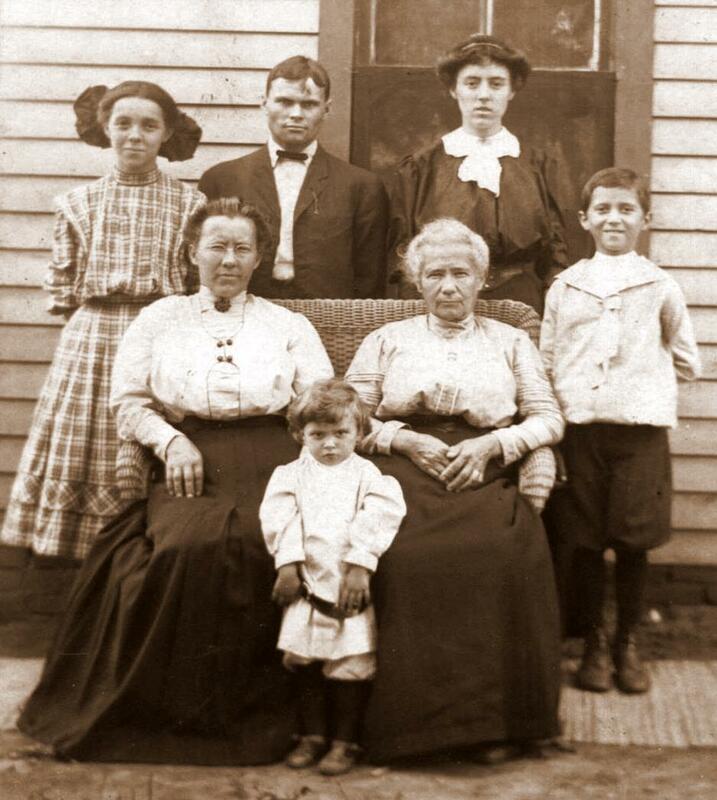 At the time of the 1910 census, Louisa was with her mother and sisters in Lincoln Township, Warren County, Iowa. The household consisted of Leathy A. Gilman age 59, Sarah Taylor age 82, Sarah Jane Burgett age 51 and Louisa Long age 61. Louisa died on April 12, 1911 when she was 62 in Braddock, Emmons County, North Dakota of stomach cancer. She is buried in Napoleon Cemetery in North Dakota with her husband and daughter Viola. Shelby County, Ohio is in western Ohio and was formed in 1819 from Miami County. Emmons County, North Dakota is in the center of the southern border of North Dakota. Braddock was established in 1898. Extreme seasonal variations in temperature made life difficult for settlers. Mrs. Thomas Long, who has been suffering from cancer of the stomach for the past year or more died Wednesday Evening, April 12, 1911, at 6:30 in Braddock, at the residence of her daughter Mrs. O. M. Vie. Louisa Taylor was born in Ohio, November 27, 1848, and was married to Thomas Long at Lincoln, Ill., March 28, 1869. Six children, two sons and four daughters were born to them, all of whom are living except the eldest child, a son, who died in infancy. Following are the names of the children: Mrs. Jos. Bertrand, Chariton, IA., Mrs. Clara Lane, Mrs. O. M. Vie, F. M. Long, Braddock, N.D., Mrs. Lura Shafer, Kintyre, N.D.
Logan County is in south central North Dakota. The county seat is Napoleon. Mr. and Mrs. Long moved from Iowa to Napoleon [Logan County, North Dakota] in the spring of 1906 and settled on a homestead six miles northwest of town. They lived on the farm until the fall of 1910 and then moved into Napoleon where they have continued to reside. While Mrs. Long as not been in the best of health for the past year or more it was not until a few weeks ago that she became seriously ill. Dr. Buzzell attended her all through her illness here and recognized from the first that she was suffering from cancer of the stomach, but her husband and children decided, after learning that neither medicine nor an operation would check the ravages of the dread disease, that they had better not tell her the nature of the malady. On Monday, March 27, her daughter, Mrs. O. M. Vie accompanied her to Bismarck where some of the best physicians of that city were consulted and of whom it was learned that nothing more than what had already been done to relive the sufferer by the local physician could be suggested. She was taken during the same week to Mrs. Vie's home at Braddock. Mrs. Long realized that she had but a short time to live and, though suffering intensely at times, she displayed the same patience that has been so noticeable all through her illness. Ever since her arrive here Mrs. Long has been prominent in charitable and church organizations. She was chancellor of the local lodge of Royal Neighbors at the time of her death and had always been an energetic worker as a member of the Ladies Aid Society after her arrival here. Kind hearted, charitable, and of a loving disposition, Mrs. Long will be greatly missed by all who had the pleasure of her acquaintance. Mr. Long, her husband, is a veteran of the civil war and is about 72 years of age. Two of his G.A.R. comrades, R. A. McCalmont and R. C. Bitner have been selected as pallbearers. The husband and son and daughters of the deceased are well know here and in the adding county of Emmons and many friends will join the homestead in sympathy for their bereavement. The body was brought over from Braddock this afternoon. The pallbearers, R. A. McCalmost, R. C. Bitner, Geo. A. Bryant, O. T. House, J. A. Wood and C. J. Hoof took charge of the casket after its arrival and escorted it to the Methodist Episcopal church where the funeral services beginning at 9 p.m., were conducted by Rev. Donald Bruce. The church was made beautiful by floral decorations contributed by the Ladies Aid and the Modern Woodmen. Many friends were present to a pay a last tribute of respect for the dead. Rev. Bruce delivered a brief sermon and spoke with feeling of the many good qualities possessed by the deceased. The remains were interred in the Napoleon cemetery. Modern Woodmen of America (MWA) and Woodmen of the World were fraternal organizations that offered insurance. The Grand Army of the Republic (G.A.R.) was an organization of veterans of the Union Army who had served in the Civil War.